Évreux is a commune in Haute-Normandie in northern France in the Eure department, of which it is the capital. Its inhabitants are called the Ébroïcienne(s) (fem.) and Ébroïciens (mas.). The city is on the Iton river. In Late Antiquity, the town, attested in the fourth century CE, was named Mediolanum Aulercorum, "the central town of the Aulerci", the Gallic tribe that then inhabited the area. Mediolanum was a small regional center of Roman province of Gallia Lugdunensis. The first known members of the family of the counts of Évreux descended from an illegitimate son of Richard I, duke of Normandy; the comtes d'Évreux became extinct in the male line with the death of Count William in 1118. The countship passed in right of Agnes, William's sister, wife of Simon de Montfort-l'Amaury (d. 1087) to the house of the lords of Montfort-l'Amaury . Amaury III of Montfort ceded it in 1200 to King Philip Augustus. Philip the Fair presented it (1307) to his brother Louis d'Évreux, for whose benefit Philip the Long raised the countship of Évreux into a peerage of France (1317). Philip d'Évreux, son of Louis, became king of Navarre by his marriage with Jeanne, daughter of Louis the Headstrong, and their son Charles the Bad and their grandson Charles the Noble were also kings of Navarre. The latter ceded his countships of Évreux, Champagne and Brie to King Charles VI of France in 1404. In 1427 the countship of Évreux was bestowed by King Charles VII on Sir John Stuart of Darnley (c. 1365-1429), the commander of his Scottish bodyguard, who in 1423 had received the seigniory of Aubigny and in February 1427/8 was granted the right to quarter the royal arms of France for his victories over the English. On Stuart's death (before Orléans during an attack on an English convoy) the countship reverted to the crown. It was again temporarily alienated (1569-1584) as an appanage for François, Duke of Anjou, and in 1651 was finally handed over to Frédéric Maurice de La Tour d'Auvergne, duc de Bouillon, in exchange for the principality of Sedan . It was heavily damaged during the Second World War, and most of its center was rebuilt. The nearby Évreux-Fauville Air Base was used by the US Air Force until 1967, and since then by the French Air Force. Évreux Cathedral has been the seat of the bishops of Évreux since its traditional founder, Saint Taurin of Évreux, most probably working between 375 and 425; Bishop Maurusius was present at the Council of Orléans in 511. The earliest parts of the present building, which is mostly Gothic, date from the eleventh century. The west facade and its two towers are mostly from the late Renaissance; the octagonal central tower dates from the late fifteenth century. Of especial note are the Lady chapel and its stained glass, the rose windows in the transepts and the carved wooden screens of the side chapels. The church of the former abbey of St-Taurin is in part Romanesque. It has a choir of the 14th century and other portions of later date, and contains the thirteenth century shrine of Saint Taurin. The episcopal palace, a building of the fifteenth century, adjoins the south side of the cathedral. The belfry facing the hôtel de ville also dates from the fifteenth century. In the Middle Ages, Évreux was one of the centres of Jewish learning, and its scholars are quoted in the medieval notes to the Talmud called the Tosafot. The following rabbis are known to have lived at Évreux: Samuel ben Shneor, praised by his student Isaac of Corbeil as the "Prince of Évreux", one of the most celebrated tosafists; Moses of Évreux, brother of Samuel, author of the Tosafot of Évreux; Isaac of Évreux; Judah ben Shneor, or Judah the Elder, author of liturgic poems; Meïr ben Shneor; Samuel ben Judah; Nathan ben Jacob, father of Jacob ben Nathan, who in 1357 copied the five Megillot with the Targum for Moses ben Samuel. 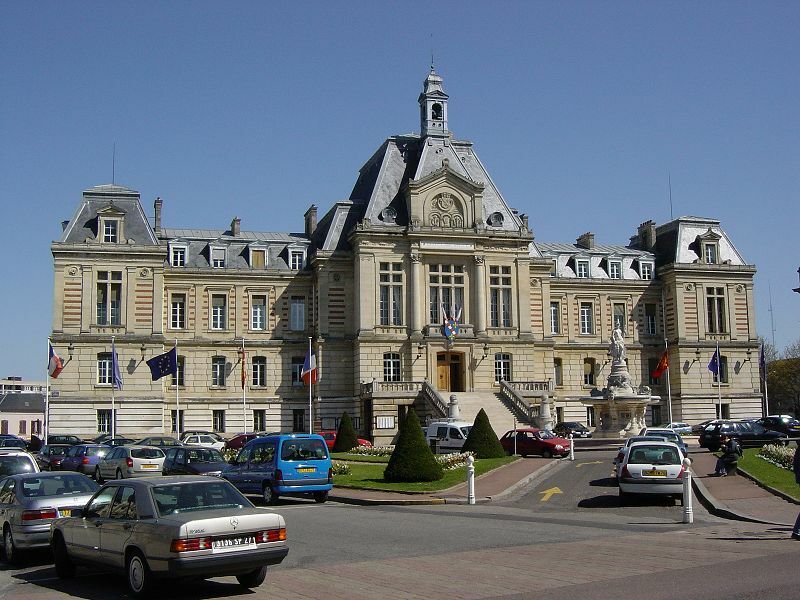 Évreux is situated in the pleasant valley of the Iton , arms of which traverse the town; on the south, the ground slopes up toward the public gardens and the railway station. It is the seat of a bishop, and its cathedral is one of the largest and finest in France. At Le Vieil-Évreux (lit. old Évreux), the Roman Gisacum, 3½ miles southeast of the town, the remains of a Roman theatre, a palace, baths and an aqueduct have been discovered, as well as various relics, notably the bronze of Jupiter Stator, which are now deposited in the museum of Évreux. The communauté d'agglomération d'Évreux has 37 communes. The canton of Évreux-Sud includes a part of Évreux and the communes of: Angerville-la-Campagne , Les Baux-Sainte-Croix , Guichainville , Le Plessis-Grohan , Saint-Luc and Les Ventes (pop:21,424). The train station Évreux-Embranchement is on the railway line from Gare Saint-Lazare to Cherbourg , it is served by regular Intercity and regional rail services to both Paris and Basse-Normandie .There used to be two stations in Évreux, only one of which remains open to this day. The second station (Évreux-Nord) served the line from Évreux to Rouen . see the tosafot on Bezah 14b, 20b, 24b; on Kiddushin 27b, 39a et passim; on Sotah 22a et passim; and in the Kol Bo, Nos. 24, 114.